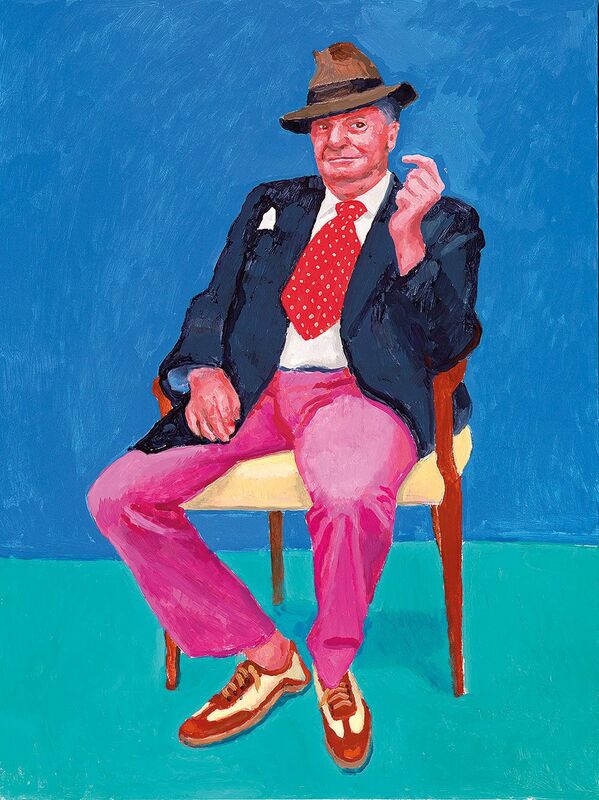 David Hockney turns 80 this year. In that time he has experimented in almost every discipline painting offers, from early pop and expressionist-inspired works to cubism and ready-mades. 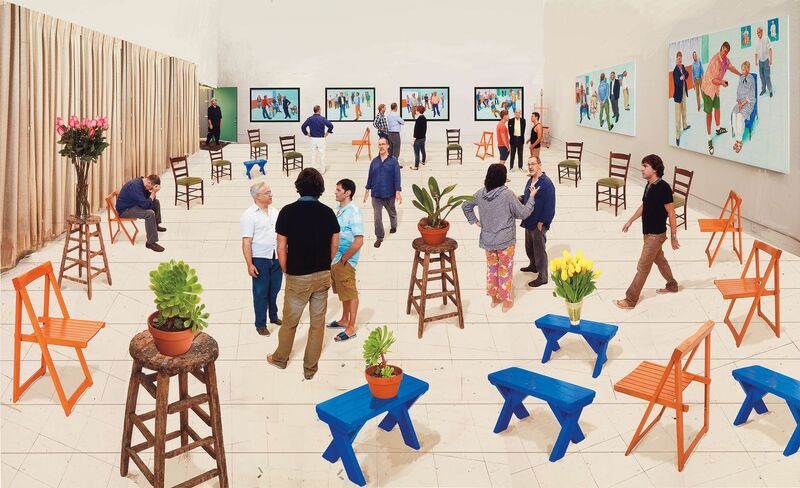 Throughout, and uniquely in a discipline that often cleaves to tradition, Hockney has shown a predilection for new technology. He has worked with photocopiers and painted directly onto film. In the 1980s he experimented with Quantel Paintbox, one of the first machines designed for making television graphics. Most recently this predilection has manifested in iPad drawings: large-scale works created with a touchscreen. A new book, David Hockney: Current, collects this last decade of work for the first, pairing high-quality reproductions with essays from leading critics and curators as well as an interview with the artist on how has practice developed. Ahead of its publication, we spoke to Simon Maidment – its author and the senior curator of contemporary art Australia’s National Gallery of Victoria – on Hockney’s evolutions and legacy. What has made Hockney's work so enduring? I think David’s willingness to experiment and innovate over time has people coming back regularly to him, to see the works they may have grown up with, are familiar with, but also to see what is occupying him today. Since the beginning he’s been an artist that has confounded expectations – I would say ‘actively’ – and his curiosity continues to drive him leading to new things. The work today is as fresh as it ever was because it comes from a place of trying something new. This is often indicated by working with a new technology, like the touch-screen or video, but not always as sometimes it’s about approaching a traditional technique with a new vigour or ambition. How has Hockney's practice changed over the years and what are the common threads that link his contemporary and early work? Formal experimentation has often been at the heart of David’s art practice; finding new ways to depict the world or an event. His is a lifelong commitment to figuration, early in his career against the backdrop of Abstract Expressionism and its championing by Clement Greenberg, and today against much more work being influenced by the legacies of Conceptual Art. David’s work has always been about seeing the world and translating the experience of seeing into different forms and narratives, whether that is the abstract idea of love and tension in an early painting like The Second Marriage, his ‘obsessive naturalism’ phase including works like Mr. and Mrs. Clark and Percy or, famously, the sun-soaked images of his Californian pool paintings, which I have called ‘casually sexualised’. They drip with carnality. Those works are all highly sophisticated yet accessible renditions of the everyday, carrying within them subtlety and much undercurrent. The works he’s made over the past 10 years – a voluminous though heavily edited selection of which appear in David Hockney: Current – share these same hallmarks with the artist striving and finding ways of showing you the world in a fashion you haven’t encountered before; which is his great skill and enduring legacy in many ways. That and his use of colour, which is beyond words and has changed art forever, to my mind. 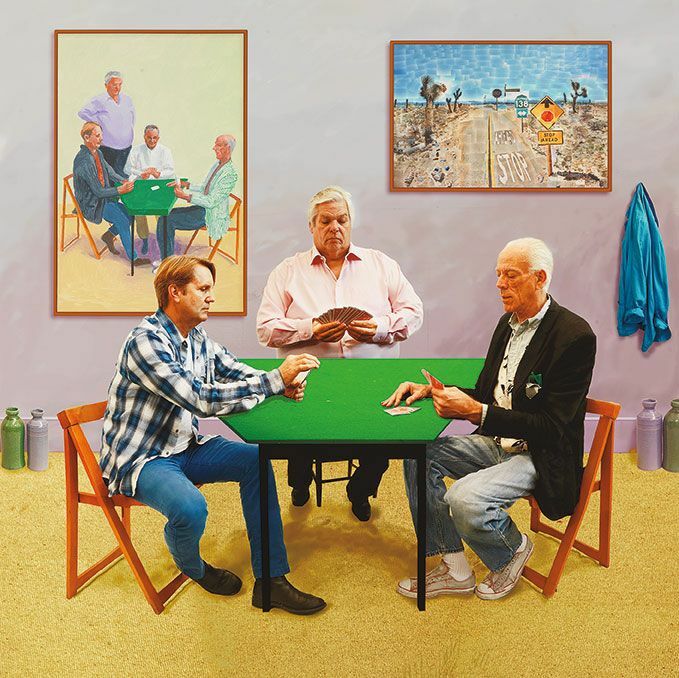 What roles to tradition and modernity play in Hockney's work? The English art historian and critic Martin Gayford has contributed a text to the publication that tackles exactly this tension within David’s practice, in which he calls David a ‘radical traditionalist’. I think this sums up the relationship wonderfully. David isn’t much interested in any prevailing fads of the day as he sees them, whether they are stylistic or theoretical (which is not at all to say he doesn’t pay attention to what’s going on around him intellectually – he’s a voracious reader). David very much sees himself and his work situated in a historical continuum, exploring the same concerns and problems as the artists he admires from the past such as Constable, Rembrandt, and Picasso among many others. 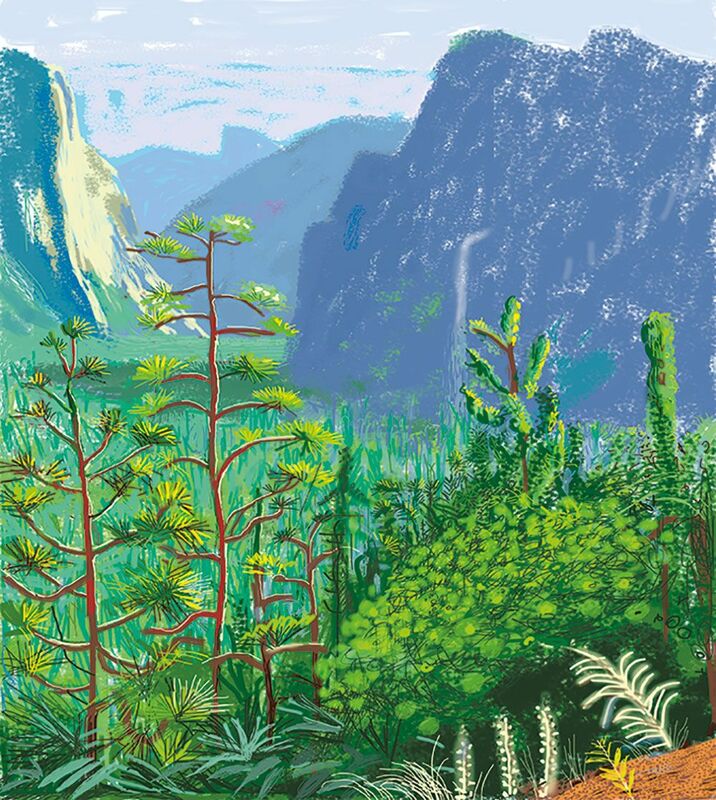 In fact, one could arguably place all of the works in David Hockney: Current in the three traditional genres of landscape, portrait or still-life. But by finding some parameters to work within, he frees himself to be radical in his approach employing any kind of mark-making device in creating works. In the past a thermal fax machine or polaroid camera and today an iPad, digital photography and Photoshop, or video. What has Hockney's impact been on painting as a discipline? The clearest influence on other painters I would hazard to say would be his use of an extreme colour palette at times, but also in the different ways he has depicted space in his career, sometimes diagrammatic, sometimes with a fixed perspective and at other times with multiple perspectives like Cubism or a scroll. He is also a model for younger artists, showing such unwavering determination, curiosity and hard work throughout his career unsated. His willingness to experiment publicly, something he admired Picasso for greatly, is exemplary and part of his enduring legacy. There is a freedom to the iPad works, in particular the ones produced with the intention of them being realised as large-scale prints, that is breathtaking. One takes a photo of the prints and views the work on a small screen and they appear almost photo-realistic – save the palette – but when you approach them in the flesh they open out and almost dissolve into scratchy marks, doodle-like leaves and abstraction, which comes from approaching the task with abandon that’s so rare to come across these days. I think the impact of the later works owes a lot to a tension between the sheer joy of taking in the overall image with the shock that one feels when looking more closely. 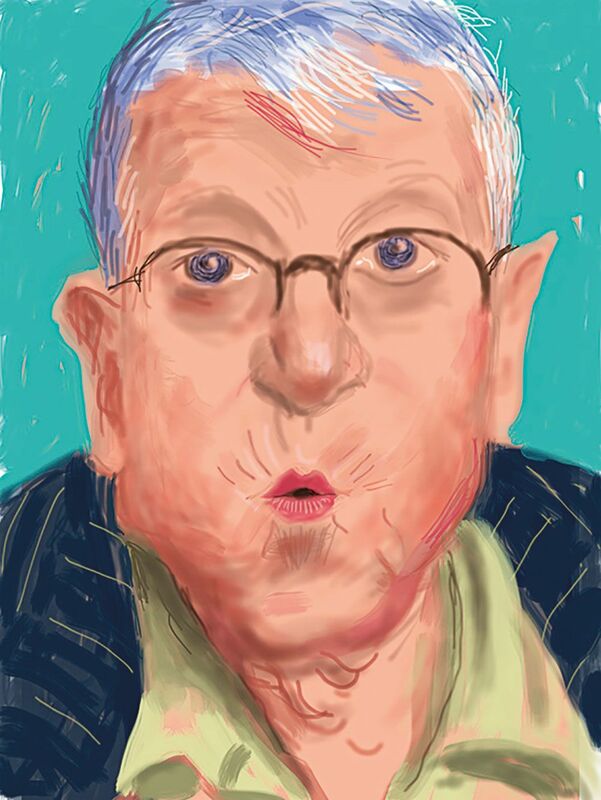 What attracts Hockney to formats like the iPad and what do they offer him that traditional ways of working don't? Some of the benefits are quite obvious and he lists simple ones with amusement: that the iPad is portable and you can have it with you all the time; that there’s no mess to clean up; that you can draw in the dark (something that had never occurred to me we were missing out on). There are a few more nuanced qualities the touchscreen has that have influenced his drawings however. The fact that it is ostensibly and endless canvas means David is able to work intuitively to create a relationship between detail within and overview of a scene. This is unique in that he can work on one section in detail and then add additional canvas around it again and again, effectively making the scene of the drawing larger as he goes. The effect of this is immediately apparent taking in the Yosemite National Park drawings where the scale of the prints rears up at you like you are actually in front of the granite cliffs (they are each around 3.8 metres high). He takes great joy in being able to make those decisions on the fly rather than having to start again or go out for more materials or canvasses – the gap between a study and a final artwork has disappeared, which increases his sense of freedom in the works I think. He has said to me that a benefit is being able to draw back over the same spot many times without harming the paper or affecting the surface of the canvas is a huge boon and I think related to this sense of the speed of decision making it affords – he is free to make a mistake or change the composition without pre-planning and the end result is the same. To return to the portability, the smaller size of the device means he can also work in front of a scene very readily, not having canvasses blowing over, and being able to shelter and work from a car in the rain. The change this has made to the temporal experience of working is very interesting. He is still at the mercy of how the light is at a certain point, but he has a great deal more freedom in terms of where he can work for periods of time and the space available doesn’t dictate the end size of the work – the Arrival of Spring in Woldgate Woods (East Yorkshire) drawings would never have been able to be as large as they are without this quality. And, as he points out, David can also draw in the dark now, so that’s something new. What will Hockney's legacy be in a century? David is already seen as a key figure in the centuries he has lived in, and interestingly, he is still surprising and confounding people. Even current bodies of work, such as the video or iPad works, people see them in reproduction and feel they know them but come away completely blown away seeing them in the flesh. That sense of the occasion of an artwork, something needing to be experienced in its proximity, is rarer these days than people let on and David’s work has it in abundance (in part because many of the works are attempts at communicating his experience of standing in front of a scene). David’s paintings of the Californian pools, and near naked men, will always be celebrated for their exuberance and sensuality, but also their timely challenge to conservatism. He’ll be seen in the lineage of great artists, including the many that he admired, Constable, Monet, Picasso and Bacon for instance, as someone who actually dedicated their life, everything he had, to challenging themselves as an artist and from one project to the next continually pushing. More recently David’s been more experimental than ever in the production and presentation of his work, creating immersive, sensory exhibition experiences. I hope people will have the chance to experience these opportunities as few scholars in the future will have the nerve to configure and display his work in the ways that he does now. Finally, his wit and warmth I think will be long remembered. He’s very funny and about the most engaging person you’re likely to meet and his presence in real life, on film or on the page continues to impress.